On October 4, 2002, Kang Sok Ju participated in a historically ambiguous but relatively significant official interaction between the US and DPRK governments. At the DPRK Foreign Ministry building in Pyongyang, a delegation led by Assistant Secretary of State James Kelly confronted Kang, who was then North Korea’s First Vice Minister of Foreign Affairs, with evidence that the DPRK had launched a uranium enrichment program in violation of the 1994 Agreed Framework. Figure 1. 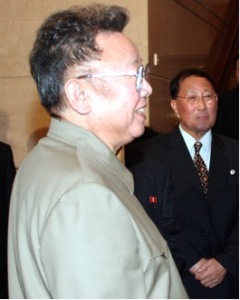 Kang Sok Ju with Kim Jong Il in 2008. Allowed by his American counterparts to begin that day’s meeting, Kang denounced President George W. Bush’s doctrine of preemption and his rhetoric that placed the DPRK in an “Axis of Evil.” Kang then said that his country was “entitled” to develop and possess nuclear weapons, a statement that US officials considered to be an acknowledgement that the DPRK was enriching uranium for nuclear arms. The Bush administration announced this interpretation to the world and the DPRK promptly denied making it, placing the country on footing to frame its nuclear reboot as a defense against US treachery. Kang died of cancer in Pyongyang on May 20, 2016, but he lives on through the language that North Korea still employs to address its weapons of mass destruction and space programs. Whether or not he originally intended his 2002 remarks as an admission or acknowledgement, many of the words attributed to him from that day have since become part of the country’s official justification of its continued development of nuclear weapons. It is slightly ironic that this rhetoric may be Kang’s most enduring legacy, given the diplomat’s critical role in numerous bids to improve North Korea’s ties with the outside world—including the Agreed Framework itself. Kang was one of Kim Jong Il’s closest and longest-serving confidants throughout his nearly three-decade career as one of North Korea’s leading diplomats, a rarified position that invites questions about what potential might have been lost. Kang began his official career where it eventually ended: the Workers’ Party of Korea’s (WPK) International Affairs Department (IAD), where he was appointed as a cadre around 1972 as part of the DPRK’s first generation of professional, well-trained foreign policy hands. At the time, the IAD was largely responsible for approving diplomatic appointments and formulating foreign policies implemented through the Ministry of Foreign Affairs (MFA). As an IAD section chief and deputy director from 1972 to 1976, Kang was instrumental in expanding the DPRK’s official diplomatic relations to non-Communist countries and a number of nations in the developing world. In addition, he helped North Korea to join or establish missions to multilateral organizations like the UN Educational, Scientific and Cultural Organization (UNESCO), the International Atomic Energy Agency and the Non-Aligned Movement. In 1981, the regime appointed Kang to his first and only diplomatic position: Secretary of the DPRK Mission to UNESCO in Paris, an office that became Kim Jong Il’s first overseas base of operations. Kim, who had been designated hereditary successor years earlier, used the Paris mission as a channel for receiving information and establishing unofficial relationships. Kang’s role at the office established his first discernible ties to the late leader, in a close working relationship that would span almost 30 years. Kang was recalled to the DPRK in 1983 and appointed Vice Foreign Minister in 1984. Following his appointment to the MFA under Kim Yong Nam, the DPRK became part of the Nuclear Nonproliferation Treaty. From the 1990s on, Kang was part of Kim Jong Il’s informal group of close aides and the Suryong’s closest foreign policy adviser, particularly with regard to relations with the United States, Japan and China. In a power dynamic that endured for years, Kim Jong Il consulted with small working groups to formulate foreign policy decisions that Kang would then implement at the MFA. This relationship persisted despite Kang’s status as the MFA’s number-two official, and it continued through the terms of two successive Foreign Ministers, Paek Nam Sun and Pak Ui Chun. From the 1990s until 2011, Kang even sat alongside Kim Jong Il during the supreme leader’s interactions with foreign leaders. The official’s extensive international experience and North Korean government contacts prepared him to serve as the DPRK’s leading diplomatic representative during the first North Korean nuclear crisis, a position in which he ultimately negotiated and signed the 1994 Agreed Framework. Under that plan, the DPRK agreed to shut down its plutonium production facilities at the Yongbyon Nuclear Scientific Research Center in return for two light-water reactors and other energy assistance from international partners. During the period of heightened engagement that followed the 1994 agreement, Kang undertook substantive interactions with the United States. He met in 1999 with William Perry, who had served as US Secretary of Defense from 1994 to 1997. Kang also accompanied the late First Vice Chairman of the National Defense Commission, Vice Marshal Jo Myong Rok, during his 2000 visit to Washington, which culminated in Vice Marshal Jo meeting then US President Bill Clinton. Later that year, Kang served as the primary interlocutor for then Secretary of State Madeline Albright’s visit to the DPRK. Figure 2. 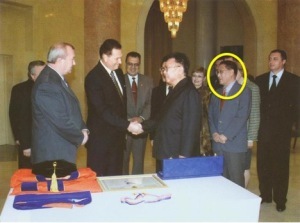 Kang Sok Ju with Kim Jong Il in the early 2000s. After the Agreed Framework collapsed in the early 2000s, Kang remained Kim Jong Il’s closest foreign policy aide. In fact, he was the only senior MFA official with a direct channel not just to the late leader but also to senior officials across the DPRK national security community. In October 2007, Kang participated in the second high-level inter-Korean summit in Pyongyang when the late ROK President Roh Moo-hyun visited the North. In 2009, Kang shadowed Kim Jong Il during his meeting and dinner with former US President Bill Clinton, organized as part of Clinton’s mission to free two detained American journalists. The close relationship between Kang and Kim became even more evident a week later, when Kang appeared as part of a large entourage attending Kim Jong Il’s visit to a shop in central Pyongyang. In contrast to dozens of other senior officials in attendance, Kang wore a shirt of the same style and color as the late DPRK leader, an honor reserved (particularly in public) for the leader’s closest aides. In September 2010, Kang moved from the Ministry of Foreign Affairs to the position of DPRK Vice Premier. He continued in his former as Kim Jong Il’s closest foreign policy advisor, but he was largely removed from the MFA’s daily affairs. Later that same month, he was elected a full member of the WPK Political Bureau, a position he held until 2015. Figure 3. 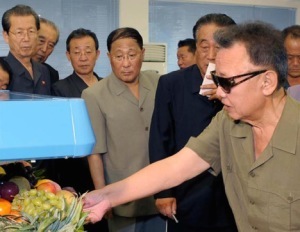 Kang Sok Ju with Kim Jong Il in August 2009. Standing behind Kang is Kim Kye Gwan. As Kim Jong Un assumed power after his father’s demise, Kang continued to play a role in DPRK foreign policymaking, though in a more ceremonial capacity. Notably, he was one of several officials involved in external affairs who accompanied Kim Jong Un on an inspection of the Masikryong Ski Resort in 2013, one of the current leader’s first public appearances after the execution of Jang Song Thaek. Presumably, his appearance in the entourage was intended to signal to external observers that a number of reliable interlocutors remained in the core leadership despite Jang’s downfall. In April 2014, Kang was appointed WPK Secretary and Director of International Affairs, a position in which he traveled overseas and received foreign delegations visiting Pyongyang. By 2015, however, recurring health problems prompted him to gradually recede from public life. At the 7th Party Congress, Kang retained his membership on the WPK Central Committee, but he was effectively retired from North Korean politics. The DPRK has lost another major foreign policy hand from the Kim Jong Il era in less than six months, following the December 2015 death of United Front Department boss Kim Yang Gon. Kang’s demise is not likely to directly affect the DPRK’s foreign policy or its strategic posture in Northeast Asia, as his failing health precluded his active participation in policy debates and deliberations in the run-up to his death. But, his nuclear and space rhetoric appears likely to remain part of the North’s diplomatic repertoire for the foreseeable future. US officials had begun this confrontation on October 3 and 4 in talks with Kang’s subordinate, Kim Kye Gwan. Mike Chinoy. Meltdown: The Inside Story of the North Korean Nuclear Crisis. New York: Macmillan, 2010. 118-123. He was semi-retired at the time of his death and had not been seen in public since August 2015, after he led a Workers’ Party of Korea (WPK) delegation on visits to Russia and Cuba. Kang graduated from the Pyongyang University of Foreign Languages and became a protégé of the IAD boss Kim Yong Nam, who is currently the DPRK’s nominal head of state as President of the Supreme People’s Assembly Presidium. These included Switzerland, Australia and Austria, as well as nations in Scandinavia, Latin America and the Caribbean. Kim Jong Il established his initial footprint in Europe at the UNESCO Mission in Paris. He dispatched his close aide and former KCNA editor Ri Myong Je to purchase a residence, set up the network through which Kim would receive information, conduct his financial affairs and acquire goods from Western Europe. Ri Myong Je would later direct Kim’s residential compounds and their requisite support staff. He is the father of current DPRK Foreign Minister Ri Yong Ho. Kang Sok Ju was related to other senior officials in the party and state, and there are unconfirmed accounts that he was a distant cousin to the Kim family. He had several children, one of whom works in the Ministry of the People’s Armed Forces and another who is involved in foreign trade. Kang was a part of the DPRK’s efforts to normalize relations with Japan, and he led the DPRK’s official and off-the-record negotiations with the Japanese government over the DPRK’s abduction of Japanese nationals during the 1970s and 1980s. Kang also participated in negotiations that facilitated the 2002 and 2004 visits to Pyongyang by former Japanese Prime Minister Junichiro Koizumi. During both of these visits Kang participated in Kim Jong Il’s meetings with the Japanese Prime Minister. John H. Cha and K. J. Sohn. Exit Emperor Kim Jong Il: Notes from His Former Mentor. Bloomington, Indiana: Abbott Press, 2012. 59-60. In 1986, Kang was elected to his first term as a deputy to the Supreme People’s Assembly and promoted to First Vice Minister of Foreign Affairs. He attended his first UN General Assembly later that same year, and he would attend subsequent sessions of the UN General Assembly during the next decade. In 1988, Kang joined the WPK leadership as an alternate, or candidate, member of the WPK Central Committee. In 1991, he delivered remarks on behalf of the DPRK when the two Koreas simultaneously joined the United Nations. In 2007, Kang became acting Foreign Minister after the death of Paek Nam Sun until Paek’s replacement by then-DPRK Ambassador to Russia Pak Ui Chun. Once Pak was installed as Foreign Minister, Kang reverted back to his First Vice Ministerial position. In a later enhancement of his power that signaled his close working ties to Kim Jong Il, Kang gained the position of Councilor of the DPRK National Defense Commission, an amorphous job title just one remove from being a member of the National Defense Commission, the country’s supreme power organization. Kang also participated in meetings with former Communist Party of Vietnam General-Secretary Nong Duc Manh during his official visit the same month.